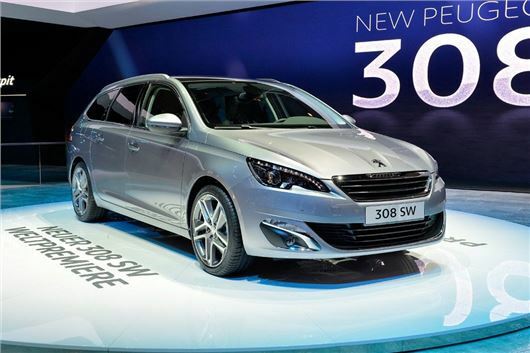 The new Peugeot 308 SW got its first public airing at Geneva, where it was also awarded the 2014 European Car of The Year award. It boasts an impressive load space, with a 610 litre boot - larger than alternatives like the Volkswagen Golf Estate. It will go on sale later this spring with prices expected to start at around £16,000. It's based on the same platform as the 308 hatchback, the SW version is 140kg lighter than the model it replaces which means benefits for both economy and handling. Engines include the 1.6-litre BlueHDi diesel which emits just 85g/km of CO2 along with a 2.0 BlueHDi with 150PS. Petrols will include the new 1.2-litre three-cylinder turbo first seen in the 208 and 2008. The cabin looks modern and innovative - as it is with the hatchback - with high quality materials and improved build quality as the company aims to move upmarket. Practical features include rear seats that fold down in a single action from inside the boot to create a flat load floor.